I've never given many period pieces like this the time of day. I mean, look at my demographic, a movie like "The Favourite" probably doesn't appeal to most males in their late 20's early 30's. It was something that wasn't really on my radar at all. In fact, it was a movie I had no idea even came out. It was one of those movies that just kind of arrived in the winter. That usually means one thing, its a movie designed for one purpose. That purpose being award season pandering. It did get lots of attention at the Golden Globes a little while back. So of course, curiosity got the better of me and I gave the movie a shot. 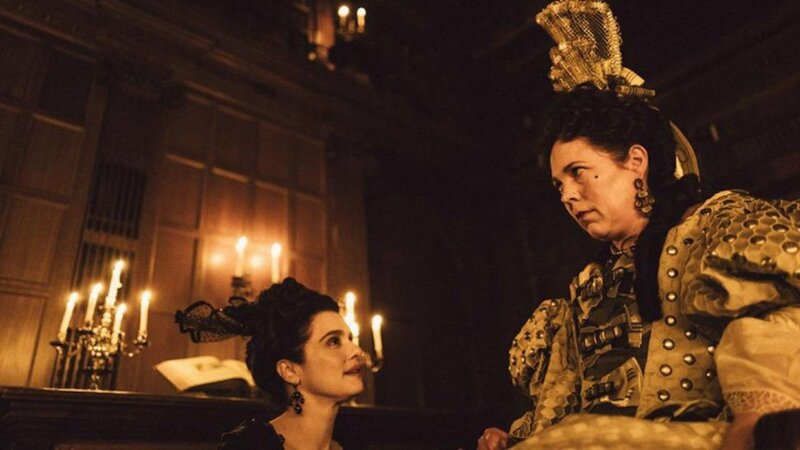 I have no idea how much of "The Favourite" is true. It follows Queen Anne, who ruled Great Britain during the early 1700's. When we meet her in the movie, her health is waning and she has no interest in governing anything. She spends most of her days having fun, messing around and betting on racing ducks. Most of the governing comes from Sarah (Rachel Weisz) who is her confidante and adviser. Sarah and Anne also have a secret romantic relationship. Sarah's plate is full; trying to keep her romance a secret, finding ways to pay for a war with France, trying to not let Parliament member Robert Harley (Nicholas Hault) undermine her. Sarah never expects someone like Abigail showing up. Emma Stone plays Abigail Hill. She's Sarah's impoverished younger cousin whose family name lost its good will thanks to her gambling father. Abigail is searching for employment, searching for a meaning of life after losing so much. At first, she does mostly maid duties, but after she cures an illness Anne has, she is quickly promoted to lady of the bedchamber. Anne and Abigail soon develop a friendship and perhaps that relationship materializes into something else? And perhaps Sarah eventually feels threatened by Abigail? Director Yorgos Lanthimos does a good job dropping us in 1700's life. Much of the first half hour or so is devoted to really analyzing how a socialite lived during this time period. There is much gossip and much daily activity and he quickly generates some big laughs. I would be lying if I also didn't admit that he finds a way to make this all fascinating. Period pieces like this run in danger of coming off dry, but with the wit and pace of the screenplay by Deborah Davis and Tony McNamara keeps things light on its feet and the laughs come naturally. Plus the costumes and sets are very well done. Its not just a comment on 1700's life and not just a bunch of rich political people cracking jokes though. There is a game being played by Sarah and Abigail for the affection of the Queen and how each girl plays against each other is part of the fun. Its a brilliant showcase of talent for both Rachel Weisz and Emma Stone. There is a reason why these two will be prominent players in the award circuit this year. Olivia Colman plays Queen Anne and she also does exemplary work and as her character's health deteriorates, she does a really good job showing it, de-glamorizing, bearing it all, its masterful work. So perhaps this is a movie you don't expect to sneak up on you. But I certainly was drawn into this films charms. There are some big laughs, and some outstanding performances here. The attention to 1700's detail is engaging. But the fun little headgames between the characters is the reason to see this movie. I didn't expect this one to work so well, and I always love a surprise. Perhaps you will too.